It is with pleasure that I announce a brand new workshop that I’ll be teaching together with Harvest Crittenden in Spring 2018. If you fancy the idea of visiting our wonderful medieval city and immerse yourself in the world of illuminated letters, both ancient and modern, this is a unique opportunity. Feel free to share this news with your friends! In this new workshop, illumination techniques such as gilding, vining, filigree and dimensional painting are taught in relation to Lombardic letters. There will be a classic approach to the topic; beginning with a brief introduction of illuminated manuscripts, you’ll learn about the proportions and typical features of the initials, the underlying principles of decoration, graceful curvature and filigree designs, the CMYK color palet, the application of leaf and shell gold, etc. However, quite early on in this journey the gracious Lady will team up with the Tramp, who will listen respectfully to what she has to say, but will nevertheless propose to take a walk on the wild side. This dual approach promises to satisfy both the meticulous calligrapher as well as the adventurous spirit. 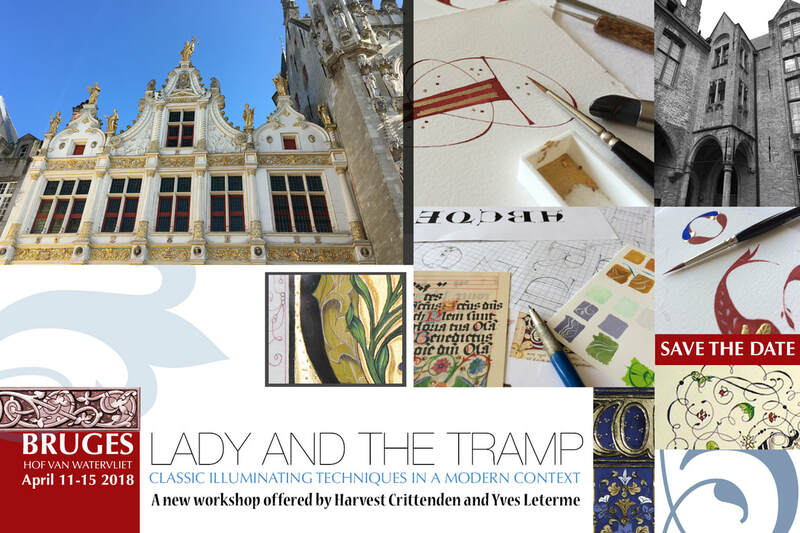 This five day workshop, open to all skill levels, is being offered in the medieval setting of charming Bruges (Belgium) and includes a specially arranged visit to view some rare treasures of illuminated manuscripts not available to the public. Harvest Crittenden and Yves Leterme, two internationally renowned calligraphers, each coming from a different background, join forces in bringing their unique perspectives to this class. Save the date! Registration opens on September 1, 2017. Send a mail to yvesleterme@skynet.be and we'll let you know further details. Thanks.